WARNING: Cancer For more information, visit www.P65warnings.ca.gov. 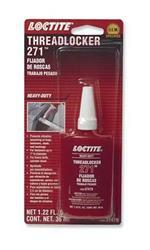 Loctite Threadlocker 271 is a high-strength, red threadlocker for heavy-duty applications. It is especially well suited for permanently locking studs and press-fit items. Threadlocker 271 adds 3,000 psi holding power to slip and press-fit assemblies. It can be used to replace setscrews and snap rings, protecting parts against loosening from vibration. Threadlocker 271 is removable with heat and hand tools, and well suited for fasteners up to 1 in. (25mm) in size. Suggested applications include frame brackets, suspension fasteners, shock absorber mounts, and wheel studs. Shipping was fast and easy. Awesome produce been using is for 30+ years. Expensive, but you get a lot and it lasts a long time. Well worth it. The picture makes the bottle look pretty small, but it's actually a very large bottle of loctite. I have a feeling I'll still have the same bottle in five years, maybe even ten, it's a LOT of loctite.